The term "nickname" denotes a title established by common usage, and does not mean that it has Department of the Army approval. "Distinctive Designation," the U.S. Army's terminology for a nickname, signifies that the title has the official approval of the Office of the Chief of Military History and is authorized by the Secretary of the Army in accordance with Army Regulations. Both definitions apply to the 14th Armored Division. Indeed, the 14th Armored Division earned its nickname, and it did so at a time when heroism, sacrifice, and achievements above and beyond the call of duty were everyday occurrences. During the final weeks of the war, the men of the 14th Armored Division liberated 200,000 Allied personnel from German captivity; among them were over 30,000 Americans (approximately 40% of all Americans held by Germany.) It was the soldiers, sailors and airmen of virtually every Allied nation who listened hopefully as the sounds of the fighting grew closer and closer to their places of imprisonment, and when the battle-scarred tanks finally crashed through the prison gates, they greeted their comrades in arms of the 14th Armored Division, as the "Liberators." 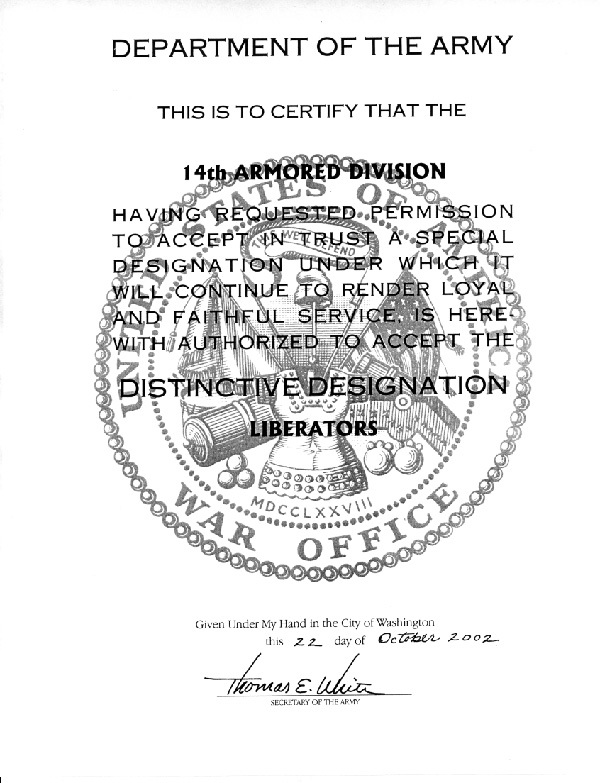 On 22 October, 2002 the Secretary of the Army awarded the Distinctive Designation (aka Nickname) to the 14th Armored Division in recognition of its unique accomplishments. As a result, the Division will forever be carried on the Official Rolls of the U.S. Army http://www.army.mil/CMH-PG/lineage/SpcDes-123.htm as the "LIBERATORS."